Opening hours: Shops in Venice are usually open 9.00-13.00 and 15.00-20.00, with some variations depending on the time of year. 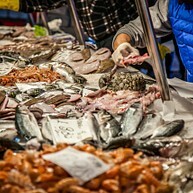 This fish and vegetable market has been around since the year 1097, and there is frantic activity here, especially early in the mornings. The fishmongers, the bustling scenes, the old facades and the fascinating canal combine to create a great experience for all senses. The city’s best butcher shops are nearby. Canal Grande is the largest canal in town, almost 4 km long and 90-metre-wide in some parts, with an average depth of 5 metres. 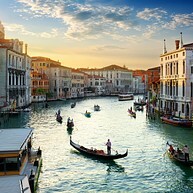 Public transport is available in the form of vaporetti - water buses-, gondolas and water taxis. There is plenty of famous buildings located along the river which is crossed by three stunning bridges. Peggy Guggenheim was the artist Max Ernst's wife; the museum is housed in Palazzo Venier dei Leoni, which is her former home. Her art collection was opened to the public in 1951, and nowadays people can enjoy art from Europe and America dating back to the first half of the 20th century. Ca' Rezzonico is one of the most magnificent buildings in the whole city, standing on the right bank of the Venice Canal. It was completed in 1756 and today it serves as a public museum with an interesting display of 18th century Venetian artefacts. 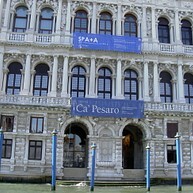 Ca’ Pesaro is the city’s modern art museum, located in an old baroque palace facing the Grand Canal. The first floor houses 19th and 20th century paintings and sculptures, while the upper floor is dedicated to the Oriental Art Museum, exhibiting 30,000 objects from Japan, China and Indonesia. Located in Palazzo Barbarigo Minotto, Palace Music (Musica a Palazzo being the original name) is a cultural association started in 2005, created to transform the palace into an intimate environment where to meet and learn more about the Opera culture. Have a look at its website to know what is in program while you are there; it will surely be a unique experience. Whether or not you are a fan of classical music, the Interpreti Veneziani is a welcome break from the city's pulsating core. 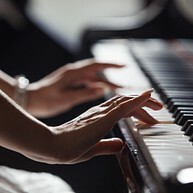 After its inauguration in 1987, its concerts have been performed all over the world, in countries such as the US, Japan, Canada and across Latin America. Take one evening to enjoy the harmony brought to you by the orchestra. St. Mary Basilica, usually called the Friari, was built in the 13th century and today represents an important landmark. Holding many masterpieces of Venetian art from the Renaissance period, it is simply a delight for the eye. Titian, the most renowned member of the Venetian school of painting of the 16th century, is buried there. Occupied in the Roman period, San Giorgio Maggiore is one of the several islands around Venice. 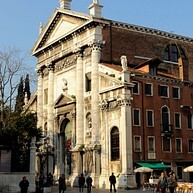 At the beginning of the 19th century, after the Republic fall, the island became a free port housing Venice's artillery. 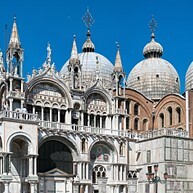 This is another perfect opportunity to capture a gorgeous panoramic view of Venice. 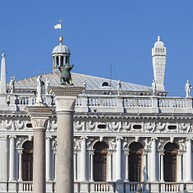 The National Library of St Mark's (Biblioteca Nazionale Marciana) is located in a beautiful Renaissance building and takes its name after St. Mark, Venice's patron. 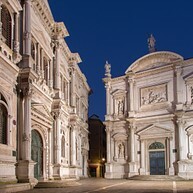 Being one of the most ancient manuscript depositories of the city, it is an exquisite place to become more familiar with the history of Venice. Let yourself be swept away by the beautiful renaissance paintings of this gallery. The Venetian painter Tintoretto was paid to provide art for the halls of the Scuola and his masterpieces are still there to be admired. Take the audio tour to get a deeper knowledge of the artist and his works. 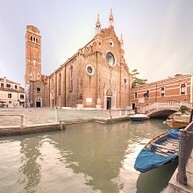 Santa Maria dei Miracoli is the most requested church for weddings in Venice, and if you step inside you will easily see why. 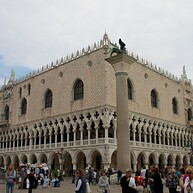 It is said to be built from the leftovers of St. Mark's Basilica, even if the latter is evidently bigger. Being one of the best examples of early Venetian Renaissance architecture, its nickname is "the jewel box", due to its striking beauty. There are several tour operators offering different types of Gondola tours. You can choose between a more romantic style with serenades sung to you and your beloved partner, or a more classical sightseeing tour with a guide telling you the history of all the beautiful buildings around. There are even tours where you can learn how to row the Gondola yourself.